I’ve found a new french fry recipe that I love. I don’t usually go for fries from white potatoes, due to their high glycemic index (and also the fact that they are often fried in genetically modified soy and/or canola oils). These jicama fries, however, provide a side dish satisfaction that is slightly similar to their white potato counterparts. Jicama is a root vegetable that is very under used in the USA. Most people don’t know how to spell it when they hear it. It’s unfortunate, because raw jicama provides 40% of your daily needs for vitamin C in just one cup, as well as 6 grams of fiber and just 5 grams of net carbohydrates. It’s also has a very low glycemic load, so it is safer for those watching their blood sugar, insulin and weight levels compared to white potatoes. One thing you should know about jicama. Jicama, even after cooking, retains a slight crisp in the center. It’s refreshing and very light. Safe to say, these aren’t your conventional french fries. Which is alright, because most of you guys (including myself) are not always conventional (if at all!). Some of my jicama fries, after baking, did become soft all the way through, but just to let you know before hand, most will be soft on the outside and slightly crisp on the inside. These baked jicama fries are delicious - soft on the outside and delightfully crisp on the inside. Experiment with the spices. 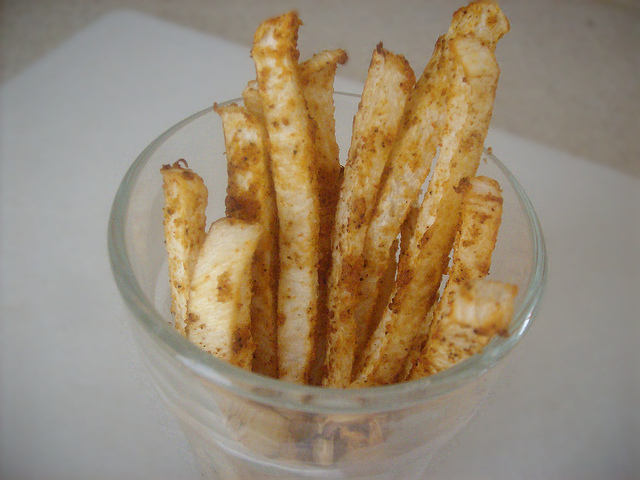 Slice peeled jicama into thin match stick shaped fries. Combine sliced jicama with coconut oil and spices. Evenly spread the fries on a cookie sheet and bake at 350 degrees for 25-30 minutes. Do you avoid white potatoes? Have you ever tried sweet potato fries? I enjoy them occasionally. Sweet potato fries are a bit lower on the glycemic index, plus they are highly anti-inflammatory. P.S. If you haven’t yet entered in my giveaway for a FREE quart (that’s 4 cups!) of organic, virgin coconut oil, please do so! It’s free to enter. Please share the giveaway to your friends. Okay, promotion over. Oh! Can’t wait to try these! We LOVE jicama! It’s sometimes hard to find, but when we do, we grab it and gobble it up! I love the sweet taste and I bet it’s awesome as fries! Thanks again, Brandon for another great recipe! I sure hope you like it, Amy. It’s different, but really, really delicious. I’m experimenting with different spices and flavors, from cayenne to barbecue. You’re welcome, Mark! Let me know if you decide to try this recipe out. I’m going to find this veggie the next time i’m in an international friendly grocery store. They look delish! So excited about this recipe! Love jicama but usually use it raw, so this should be fun. Keep us updated with the new flavors for sure! Oh my gosh these are delicious (she types whilst eating)!!! Is it right to down an entire jicama this way? Sure feels like it. Many thanks for this amazing recipe! I have actually eaten almost the entire recipe myself, Andrea! They are really, really good, even raw. Shoot I forgot the rating. This goes with the above!!!! Just put a few of these in the oven! I used a little bit of cayenne instead of paprika– only because I didn’t have any, so I think they’ll come out pretty spicy. In any case, I’m itching to eat this dish. It’s starting to smell amazing! Thanks for the recipe! Now I know what to do with my leftover jicama!! Sounds good, Missa! I really do love this recipe for a nice, healthy, light snack. Enjoy! You are currently reading "Jicama Fries"